הושע הא / Hosha na, please save! Today -- the seventh day of Sukkot -- is also a minor festival in its own right, called Hoshana Rabbah. On this day it's customary to recite alphabetical acrostic prayers called hoshanot. This is the hoshana that I most needed to pray this year. May its words ascend on high; may its implications sink deep into our hearts and shape our actions as we move into the new year. For those who are interested, here is another contemporary Hoshana for Healing and Consolation by Rabbi Dr. Dalia Marx, published at the Open Siddur project in Hebrew and in English translation. Chag sameach / a joyous festival to all. I fling myself down too. wrapped around me like a tallit. what I should have done. From the ocean of grief. From wishing I had an "us"
I could ask God to save. The sukkah begins to come apart. how to celebrate what can't last. there will be more abundance. How to rejoice in what I don't yet have. and I'm not crossing the sea alone. with honey, sweeten every decree. We beat our branches / against the earth. On this day it is customary to take willow branches and beat them against the ground in an embodied prayer for rain. The sukkah becomes to come apart. See Pictures and words (Hoshana Rabbah), 2012. How to rejoice in what I don't yet have. This is the spiritual work that Sukkot asks of us. See Joy Like Our Lives Depend On It by Rabbi David Evan Markus. The ebb and flow. I learned from my teacher Rabbi Elliot Ginsburg that the Jewish year, and that spiritual life in general, has an ebb and flow; see The year as spiritual practice, 2009. I'm not crossing the sea alone. Our daily liturgy includes "Mi Chamocha," the song our ancestors sang after crossing the Sea of Reeds. Often from the bimah, as I play the guitar chords that usher us in to the melody we usually use for this prayer, I remind the room (and myself) that whatever we may be facing -- with the Egyptian army behind us and the sea ahead of us, as it were -- we never have to cross the sea alone. We have each other. We have God. We have the presence of love to companion us in our crossings. Drench me / with honey, sweeten every decree. Some maintain the custom of continuing to eat challah or apples dipped in honey not only on Rosh Hashanah, but all the way through the holiday season until tomorrow. One tradition holds that today is the day when the "decree," the verdict for the world declared on Rosh Hashanah, is finally sealed. I like to think that though we can't avert whatever life has in store for us, we can seek to sweeten it -- for ourselves, and for each other. Moadim l'simcha -- wishing you joy in the festival; may this be a season of rejoicing. All the world feels redolent with apples and honey at this time of year. I've taken our son apple-picking twice since Rosh Hashanah. We go to a local orchard, only a few minutes away from our house. I love the palpable abundance of apple trees laden with fruits. And there's nothing else quite like the spicy-sweet crunch of a honeycrisp apple, especially one we've just plucked from the tree. And when I look out the window in the morning, or step outside into the sukkah, or walk around the playground, the trees are brilliant orange and yellow. When the sunlight filters through their leaves, the very air feels honey-colored: golden and bright. The hillsides are an autumnal kaleidoscope, shifting and changing as the jewels of the leaves tumble, catch the light, float through the air. It's easy to wish, "if I could only capture this moment!" Right now, with the trees all rustling and brilliant, with the sukkah standing proud in the backyard, our son singing silly songs in the car on the way to preschool. But even as it's happening, it's changing. Already some of the trees have lost the leaves at the top of their highest branches. The end of one thing, the beginning of the next. Today is the seventh day of Sukkot, also known as Hoshanna Rabbah. Rabbah means great; hoshanna means "please save us!" In many communities people gather today to recite hoshanot, prayers which beseech God to save the earth. In the immediate aftermath of the climate march, with the drumbeats of the need for change ringing in our ears, these prayers take on a different urgency. This year of 5775 is a shmita year, a sabbatical year, during which Torah teaches we are not to harvest in the land of Israel but instead to let the earth rest and lie fallow. "By the time the next shmita year rolls around," one of my colleagues said to me recently, "it will be too late to turn the earth around." A sobering thought. Ana Adonai, hoshia na -- please, God; please save us! -- takes on new resonance. Another Hoshanna Rabbah custom is circling the sanctuary seven times holding our lulavim, the bunches of branches with which we have beckoned blessings all week, and then beating the willow branches against the ground. The falling leaves represent the rain which is always so urgently needed in the Middle East. We don't observe Hoshanna Rabbah in any formal way in my congregation. There will be no circumnambulations of the sanctuary, no beating of willow branches against the patio stones. But I will watch leaves fall from birch and oak and maple as the day unfolds. They drift and spiral to the ground, and they evoke the precipitation which I know will fall as the season deepens. Already our lawn is becoming obscured by their fading colors. I know that it won't be too long before the lawn is obscured instead by fallen snow. And then it will be green again, and so will the trees. The end of one thing, the beginning of the next. I read recently that the leaves of our deciduous trees contain these astonishing pigments all the time, but when photosynthesis is happening, the chlorophyll obscures the reds and oranges and golds. And then the trees gracefully let go of the need to keep producing food, trusting that their reserves will see them through what's coming, and for a gleaming fiery moment their hidden brilliance can shine. on the night of heavy rain. Slivers of color adorn the lawn. Your tears fell like willow leaves. who understands that at four? our spool of kitchen string. Now paper plates spin and clatter. then bursting back into view. Re: "Your tears fell like leaves" -- today is Hoshanna Rabbah, when it is customary to beat our willow branches on the earth; their falling leaves represent our prayers for rain. release the scent of thyme. more a sketch of itself. this ark and all that it holds. of honey on our bread. pulls us forth into freedom. The stanza about asking God to save "this ark and all that it holds" is a reference to the hoshanot, the prayers asking God to save the earth, recited on Hoshanna Rabbah. Beating willow branches until the leaves fall like rain is another of the day's practices. One tradition holds that we eat challah drizzled with honey not only on Rosh Hashanah at the new year, but all the way through the holiday season to Shemini Atzeret, which is today. I'm wondering whether I should cut the first three stanzas. What do you think? 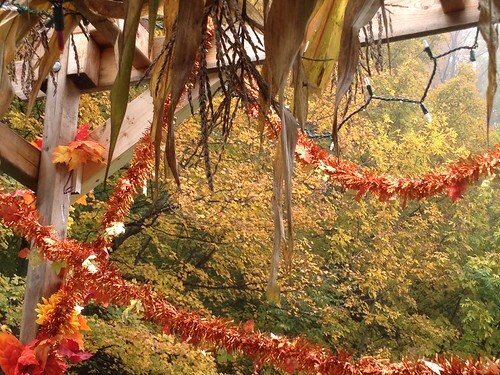 There are three distinct and special celebrations at the end of Sukkot. The first of them, Hoshana Rabbah, is today. Even if you're not dancing or processing around a sanctuary with branches and Torah scrolls, reading some hoshanot and reflecting on their meaning is a lovely observance of Hoshana Rabbah. I like the ones written by my teacher Rabbi Zalman Schachter-Shalomi, which online here at the Reb Zalman Legacy Project blog, and also here at the Shalom Center (with commentary from Rabbi Arthur Waskow below the hoshanot themselves.) And here's a brief excerpt from a translated hoshana, provided by Rabbi David Seidenberg of NeoHasid.org. Shemini Atzeret -- "The Pausing of the Eighth Day" -- is the eighth day of Sukkot. Yes, Sukkot is a seven-day holiday, but tradition tells us that on the eighth day, God (Who has been so enjoying spending time with us in our sukkot) says "awww, do you really have to go? Can't you linger a little longer?" So we stay in our sukkot for one more day, one more chance to engage in intimate connection with Shekhinah, the immanent and indwelling Presence of God. This is a day for spaciousness, a day of pausing, a day to celebrate the white space which cradles and contains all of the texts and teachings and observances of the holiday season now ending. The Days of Awe and Sukkot are a dense and busy time, full of obligations and sermons and teachings; Shemini Atzeret is a chance to pause, to take a breath, to receive the blessings of stillness. This day is a hinge-point in our liturgical year between the summer season and the winter season. On Shemini Atzeret, we recite special prayers for rain, and we enter into the liturgical winter-season when our Amidah contains a one-line prayer for rain every day instead of the summertime one-line prayer for dew. I've written a contemporary prayer for rain which can be read / davened on this day, which you can find in the VR archives here; you might also enjoy my Sestina for Shemini Atzeret, which I wrote last year and which I still really like. Shemini Atzeret is the 22nd of Tishrei, which begins tonight at sundown and lasts through tomorrow (Monday). It's possible to experience a kind of holiday fatigue at this moment in the year. Tisha b'Av, then the month of Elul, then Rosh Hashanah, the Ten Days of Teshuvah, Yom Kippur, a week of Sukkot...! But there's beauty and meaning in each of these three final days of this holiday season. I offer this blessing: may each of us find a point of access into the beauty and wisdom of Hoshana Rabbah, Shemini Atzeret, and Simchat Torah. May we connect with the gift of being able to ask for help in healing our world, the gift of holy pausing and sacred rest, and the gift of Torah, the story which never ends. Today is Hoshana Rabbah, the seventh day of the festival of Sukkot which is also a minor holiday of its own. The name means "The Great Hoshana" or "The Great 'Please Save Us'!" It's traditional, on each day of Sukkot, to make a circuit around the interior of the synagogue or around the Torah-reading table carrying our lulavim and reciting a hoshana (supplicatory prayer); on the seventh day, we make seven circuits and recite seven hoshanot. R' Shlomo Carlebach singing a wordless niggun on Hoshana Rabbah. These Hoshanot in English by Reb Zalman follow the model of the traditional Hebrew Hoshanot, which are aimed at the protection and healing of the earth from locusts, drought, etc. These English versions do so not only in the line-by-line meaning, but also by celebrating, day by day, the aspects of the universe that (according to the first chapter of Genesis) were created on each of the original seven days. They also draw on the alphabetical pattern of the traditional Hebrew Hoshanot. Even if you're not dancing around a sanctuary with lulavim and Torah scrolls, reading Reb Zalman's hoshanot and reflecting on their meaning is a lovely observance of Hoshana Rabbah. They're online here at the Reb Zalman Legacy Project blog, and also here at the Shalom Center (with commentary from Reb Arthur below the hoshanot themselves.) Reb Zalman has also written a separate bilingual hoshana (the Hebrew is an alphabetic acrostic; the English is a translation) which is online here, and which speaks out of contrition for how we've damaged creation. Speaking of Reb Zalman, I'm happy to be able to report that his beautiful English-language siddur (prayerbook), Sh'ma, is once again available in print. I just ordered myself a copy; if you have any interest in Jewish prayer in English, it's $10 well-spent. You can order it online here. Tomorrow will be Shemini Atzeret, "the pause of the 8th day" -- it's the extra day of celebration tacked on at the end of the seven days of Sukkot. It's customary to recite special prayers for rain on that day; last year I wrote a contemporary prayer for rain to be recited on Shemini Atzeret. If you're interested, you can find it here. I recently encountered a beautiful teaching by the Sefat Emet (Rabbi Yehudah Aryeh Leib Alter of Ger; I've blogged his teachings many times before.) This is one of his teachings for Hoshanna Rabbah (the seventh day of Sukkot) and can be found in The Language of Truth. It's about prayer. On Hoshanna Rabbah we beat willow branches against the ground. The willow, he says, represents speech, which connects it with prayer (prayer being, after all, a form of speech.) The willow is also associated with David, the psalmist, who said "I am my prayer before You." Prayer is all we have for reaching God. In some sense that may seem either inadequate or chutzpahdik. On the other hand, prayer is all we need for reaching God. The leaves of the willow are shaped like lips, and our lips are the gates through which our prayers pass. At the end of Yom Kippur we make much of how "the gates are closing." We seem to need the catharsis and the drama of dipping deep into the experience of that day as though, when that day ends, our chance to reach God were over. Though the tradition also says that the gates of repentance remain open through Hoshanna Rabbah (some say, through Shemini Atzeret, the 8th day of Sukkot)... and really, says the Sefat Emet, the gates to God are always open as long as we use our lips to pray. Our mouths are the gates. When they are closed -- when we perceive that God is far from us -- that's because we've closed the gates ourselves. That's the heartbreaking news: our experience of God as being distant from us is our own doing! But the good news is, opening the gates is always within our power. All we have to do is open our lips. The seventh day of the festival of Sukkot is also known as Hoshanah Rabbah, "the great supplication" or "the great 'save us'!" (That'd be today, in case you weren't keeping track.) Today is the day when, according to Jewish tradition, our relationship with water in the coming year is sealed. Some see Hoshanah Rabbah as the culmination of the holiday season that began with Rosh Hashanah, and regard today as the day when judgement is finally passed on who we are and who we aim to be. I just learned this fall that it's considered a mitzvah to eat one's challah with honey all through the holiday season (not just on Rosh Hashanah), and that Hoshanah Rabbah marks the last day when it's appropriate to savor the honeyed tastes of the holidays. In an age when we strive to be conscious of our ecological footprints, when we're aware of how precious a resource water is (and how easily, and unthinkingly, we waste and pollute it), Hoshanah Rabbah may have new resonance. Today offers an opportunity to reconnect with our longing for rain, and for divine help in saving ourselves from the environmental dangers we know we don't want to bring upon ourselves, our children, and our home. Source of all that is! Help us tap into Your sustenance in the coming year. Shower us with mayim chayyim, living waters, in all four worlds. In the world of actions and physicality, give us real water to irrigate with and to drink. In the world of emotions, let our hearts move us as mighty currents move the seas. In the world of thought, let our minds be as clean and clear as the purest waters. And in the world of essence, let us truly know ourselves as beings mostly made of water, sustained by Your ineffable wellspring in all that we do. Technorati tags: religion, Judaism, HoshanahRabbah.